← TOMS take over the world. It’s no secret that I am a veteran Tory Burch fan and I am lucky to have a terrific and lovely personal shopper, Ann Oliver, out of the Beverly Hills shop. While perusing the fall offerings, I found the most amazing lug-sole (read: you won’t trip) high heeled boots. 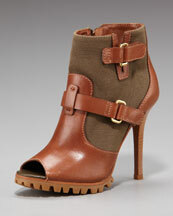 They are decidedly anti-Timberland (remember “Jenny from the Block?” – oy) and gorgeous! Purchase at Neiman Marcus or Tory Burch. Posted in Uncategorized and tagged envy, fabulous, new and fun, trending. Bookmark the permalink. As a mom, lifestyle expert, surfer and event planner, I love to discover the next uber-cool thing! Whether it's a shoe, a wine, a food, a photographer, a designer, a blog, a flower or a travel spot, you can find me trolling for it! I also like to blog about the kids and how running a household like this keeps me grounded. I love all things beautiful, but mostly Mr. F4 and the little ones, Ava and Leo. Things I love: sparkly anything, homecooked meals, snowy white sheets, holidays, photography, monograms, antique silver, reading everything I can get my hands on, Pilates, learning anything new, antiquing, gardening, collecting cookbooks and shoes, mixing slouchy sofas w/ sleek chairs, collecting china, the beach, Ruzzetti & Gow seashells, seersucker, Sharpies, Chanel lipgloss, counting my blessings. Drop me an email or a comment and I look forward to meeting you!